We are Waitaha. We are the water containers of the Creator, therefore we have been imbued with the many forms of waters containing the many gifts of all that is in the Universe. The sacredness of the child is in you. …. It is spoken now as it has been in our distant past. We are always here in the Universe. For there were many water containers of many forms, of many nations. We follow Rongomaraeroa the Goddess of Peace. Waitaha is older than old. Until now we have hidden our beginnings and all that followed, in the shadows. In this way we protected our knowledge in the silence of the schools of learning. Tuatara is the keeper of knowledge. We lead you past our ever vigilant caretaker and invite you to share the words and wisdom of our ancestors. For it has been decided it is time for our treasures to be brought into the World of Light. Haere mai, nau mai. 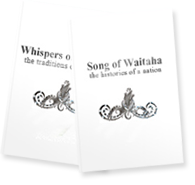 Last of Song of Waitaha.